1. Find the right drop-off locations. 2. 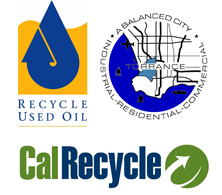 Find a certified used oil collection center. Many private businesses like gas stations, auto parts stores and auto repair shops, have been certified by the State to collect used motor oil from the general public and to reimburse residents 16 cents per gallon or a redeemable coupon. Torrance has about 20 participating locations. 3. Go to collection events. Visit our events calendar for upcoming events in your area. Pack household hazardous waste in a cardboard box so that it does not spill during transport. Be prepared to leave your containers. Put your box of household hazardous waste in the trunk of your car, away from passengers during transport. At the collection site, trained personnel will ask you to remain in your car while they remove the household hazardous waste from your trunk. What Happens to Collected Household Hazardous Waste? Motor oil is made into lubricants, marine diesel fuel, supplemental fuel and tar by-products such as asphalt cover and re-refined motor oil. Household hazardous waste that cannot be recycled or reused is carefully packed into special drums for proper disposal at specialized facilities. Most programs will not accept electronics or hazardous wastes from businesses. Businesses can contract directly with collectors licensed by the City or, if only small amounts are involved, businesses can sign up for the Small Quantity Generator Program available through the City of Los Angeles to all small businesses in LA County. The illegal dumping of hazardous waste carries a minimum fine of $5000 per day per violation up to $100,000 per day per violation and imprisonment. Section 25189.5, Health & Safety Code. Go to www.TorranceCA.gov.PublicWorks for full details.